While Yamagata Prefecture may be locally known as the land of cherries, it's also home to a rather unique flower hat festival! 2017 marks the 56th year since the Yamagata Hanagasa Festival (山形花笠まつり・Yamagata Hanagasa Matsuri) began. 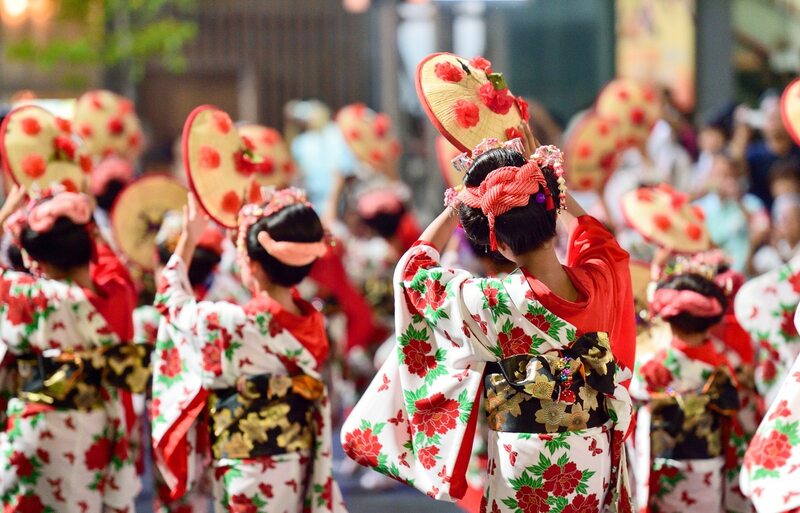 While there are many participants in the festival's dances, each year only a handful of local women have the honor of being chosen as "Miss Hanagasa"—six for this year! Hanagasa literally means "flower" (hana) "hat" (gasa). You can actually see similar hats in traditional Japanese festivals in Tokyo and other regions. Here we can see the Miss Hanagasa 2017 winners wearing their traditional Japanese makeup during the festival. One thing I really liked about this festival was seeing the participants wearing different colors and different patterns of yukata. It can seem a little dull when the participants are all wearing the same clothes, but the Hanagasa Festival feels more like a fashion show! The Hanagasa Festival is held from August 5 to 7 each year. And don't worry about getting lost—the parade starts right in front of Yamagata Station! Just follow the crowd and you'll know right where to go!